cooks and master chefs around the world. 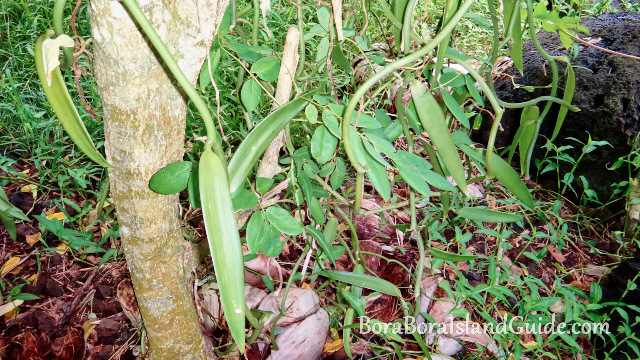 Botanists named this tropical bean plant Vanilla Tahitians. Most of the world's vanilla crops are Vanilla planifolia, which is produced on Madagascar, Reunion, and neighboring islands in the Indian Ocean. 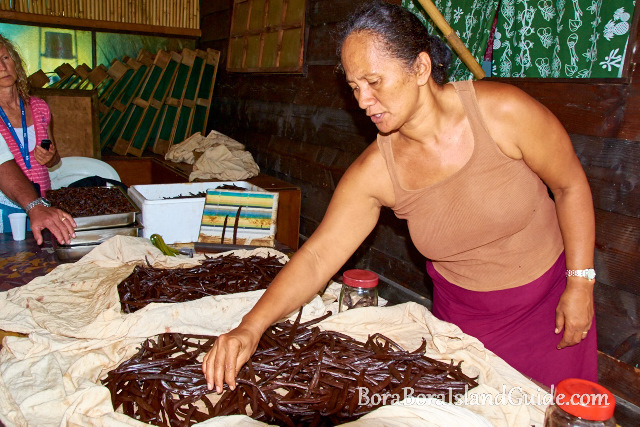 Planifolia is commonly called 'Bourbon vanilla', from Reunion's previous name lle Bourbon, or 'Madagascar vanilla', and doesn't have the exquisite flavor of Tahitian vanilla. Vanilla planifolia is grown prolifically as it's beans exude a bouquet of aromatic, floral notes which is highly valued in the perfume industry. So it's also known as Vanilla frangrans. A third less popular species, Vanilla pompona, is grown in the West Indies, Central America, and South America. Where Did Tahitian Vanilla Originate From? A Totonic myth from the east coast of Mexico tells how Princess Xanat's father forbade her to marry a mortal, so the lovers hid together in the forest. But (like all good tragedies) they were captured, and beheaded. According to this romantic tale, an exotic orchid vine grew in the place where their blood wet the ground. In the 15th century the Aztecs invaded from the central highlands. They forced the Tetonics to submit to their rule and pay tribute by sending vanilla fruit back to the Aztec capital, Tenochtitlan. It is thought that a dashing, Spanish conquistador, Hernan Cortes, introduced vanilla (and chocolate) to Europe in the 1520s. Which explains why the name 'vanilla' derives from the Spanish word, 'vaina' meaning 'little pod'. For the next 300 years Mexico had a monopoly on exporting vanilla because only a local species of Melipona bee knew the secret of pollinating the vanilla orchid, so that the flavorful bean fruit sets and grows. It was big news when in 1806 Charles Greville's plant collection in London featured the first vanilla orchid to flower in Europe. Cuttings were taken to the Netherlands and Paris. 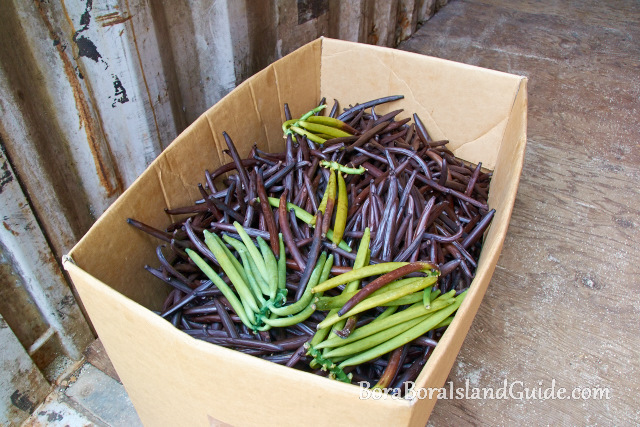 By 1819 excited French entrepreneurs began shipping vanilla pods to Mauritius and Reunion Islands, to utilize cheap labor in a suitable climate. But the vines wouldn't produce fruit, even when they tried to bring in the Mexican bee. In 1836, a botanist, Charles Morren, was having coffee on a patio in Veracruz when his curiosity was aroused. He noticed bees landing on vanilla vine flowers and making their way under a flap inside, transferring pollen in the process. A few hours later he observed that the flowers had closed, and a several days later that vanilla pods were forming. But his own experiments to hand pollinate failed. This delicate technique was not developed until 1841 when Edmund Albius, a 12 year old slave on the French island of Reunion, discovered how to effectively pollinate an orchid by hand. Vanilla plants were then sent from Reunion to Madagascar, Seychelles and Comoros Islands. Over they years they were taken to other tropical islands, and presently Indonesia is said to produce almost 60% of the worlds Vanilla planifolia. Today three vanilla species are cultivated globally. They all derive from the original Vanilla planifolia plants sourced in Mesoamerica,. Analysis shows that Tahitian vanilla is probably a cross between Vanilla planifolia and Vanilla odorata. We took a boat ride to visit a lush Tahitian vanilla farm and the Polynesian mamma told us that the first species was introduced to Tahiti from the Philippines in the 1700s, and the second came from Madagascar in the 1800s. We learnt about the process of growing Tahitian vanilla and why it is such a highly prized and versatile spice. What do vanilla beans cost? Real vanilla is the second most pricey spice in the world because it's cultivation and drying are both so labor intensive. There have been huge variations in the price of vanilla over the years due to a period of cartel control, occasional cyclones ravaging crops, and the laboratory development and manufacture of imitation 'vanillin'. About 95% of vanilla products are now flavored with 'vanillin'. If you've noticed how flat imitation 'vanillin' tastes, compared to the real spice, it's because extract from seed pod is a complex mixture of 171 identified compounds. In contrast, artificial vanilla essence has only one, 4­hydroxybenzaldehyde, named vanillin, which is also the major flavor and aroma component in real vanilla. Vanillin was first isolated in 1858 and within a few years was being synthesized from lignins in pine tree sap. Today most vanillin is a by­product of pulp for paper­making. In the United States casterum, from the castor sacs of mature beavers, has been approved. It's used as a vanilla and raspberry flavor additive in food and drinks and listed as 'natural flavoring'. Be sure of the source when buying vanilla powder! For example, in Mexican tourist markets, it's been found mixed with tonka bean, which contains coumarin, a liver toxic substance. Real vanilla beans! The green ones are freshly picked and the brown ones have been dried. Explore the diversity of culinary uses for Tahitian vanilla that make it the favorite of gourmet chefs around the world.